Quinlan races against time to move the dwindling troops into place and support Tacitus’s surge against the Berber horde. Can he hold out against the vampire menace lurking in the desert and fulfill his mission? * The origin of Mr. Quinlan from The Strain—by Pan’s Labyrinth and Pacific Rim director Guillermo del Toro and writer David Lapham—begins here! 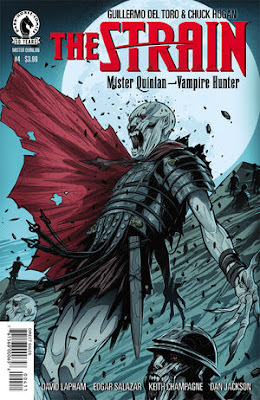 Quinlan and his Roman soldiers battled vampire hordes in this issue. During the last hour before dawn, and later, when the vampires hide during the day in the desert. The Strain: Master Quinlan, Vampire Hunter is a vampire tale that is gritty, bloody, with a taste of humanity.